Sailing is easier than you think. Follow these easy steps to help get your sea legs. As summer lingers, September might be the best month of all to be out on the water, and nowhere is better than Seattle for beginner sailors to get under way. Around here, there are so many sailboat rental options, it’s easy to hoist a mainsail, heel out and head up into the wind (see glossary below). If you’ve got sailing experience, you just have to pass a simple test to take command of a boat; if you’re a career landlubber and have never captained a sailboat, get your sea legs first by taking one of a multitude of local classes in which you learn the basics of reading the weather, harnessing wind power and steering. Boom: The spar at the foot of the sail. Don’t let it hit you when you tack! Capsize: Bottoms up! Try to avoid it. Consider starting at Lake Union’s venerable Center for Wooden Boats (CWB; cwb.org), a nonprofit dedicated to celebrating our region’s small-craft heritage by preserving and sharing older wooden boats and maritime skills. An annual membership to CWB ($40/individual or $55/household) gets you discounted rates on skills classes and access to the center’s rental fleet of 15 small sailboats—most of which were built between 1920 and 1950, and serve double duty as museum artifacts. Keelboat sloops such as the 20-foot Blanchard Junior Knockabout—built in Seattle by Lake Union’s Blanchard Boat Company during the Depression—rent for $35/hour for members ($50 for nonmembers). Smaller boats, such as the 12-foot Beetle Cat, designed in the 1920s by Massachusetts fishermen as a weekend pleasure sailer, go for $25/hour ($30 for nonmembers). Prospective CWB sailboat renters need to demonstrate competence in sailing away from the dock and out into Lake Union, executing rapid windward tacks, completing a circle and trimming the sail accordingly through various tacks and jibes, and maintaining control back to the dock with sails up and luffing. If none of that makes sense to you, sign up for CWB’s SailNow! program, a series of seven two-hour lessons for adults on the basics of sailing ($335/members; $375/nonmembers; Saturdays and Sundays this fall beginning on October 6 and November 10). CWB also offers lessons for intermediate sailors and private lessons. For less nostalgia and more and varied options for wind power, visit Sail Sand Point (sailsandpoint.org) on the shores of Lake Washington within Magnuson Park (near the new Arena Sports facility). There, a “season pass” program allows qualified sailors to check out any of eight different types of small sailboats during “open boating” hours (4‒7 p.m. some weekdays, noon‒7 p.m. Saturdays and Sundays in September; check website for more info). Sail Sand Point’s fleet includes Lasers, Catalinas, Hobie Cats, Flying Juniors, Optimists, and more. As at CWB, if you want to rent a boat, you’ll first have to pass a skills proficiency test, which will include rigging, sailing upwind (with tacks), sailing downwind (with jibes), capsizing (gasp!) and returning to the dock. Sail Sand Point also offers group lessons for beginners and intermediates, as well as private lessons. At Windworks Sailing Center at Ballard’s Shilshole Marina (windworkssailing.com), you’ll be sailing on bigger boats—ones that can take on the ocean tides of Puget Sound. Beginners there take intro lessons that are more about serving as crew than about taking out small boats solo. The center’s Intro to Sailing class, a two-hour tour on Puget Sound, complete with a captain and crew, is a great way to get acquainted with sailing before deciding to commit to a longer, more intense series of classes. Windworks also offers an eight-hour keelboat crew lesson, as well as a whole series of lessons for more advanced sailors. Beyond teaching sailing, Windworks specializes in “bareboat” and “skippered” charters by the half-day, full day, or for one or more overnights as well. Its fleet of more than 30 sailboats range in length from 25 feet to 63 feet (rates vary depending on the boat). Of course, there are other ways to enjoy sailing without having to learn anything whatsoever. Hopping a ride on a larger sailboat with its own captain and crew is a sure way to maximize exhilaration while minimizing responsibility. Emerald City Charters (sailingseattle.com) takes passengers on one-and-a-half- and two-and-a-half-hour sailing tours of Puget Sound out of its Elliott Bay slip at Pier 54, near Pioneer Square, on one of two 70-foot racing sailboats. 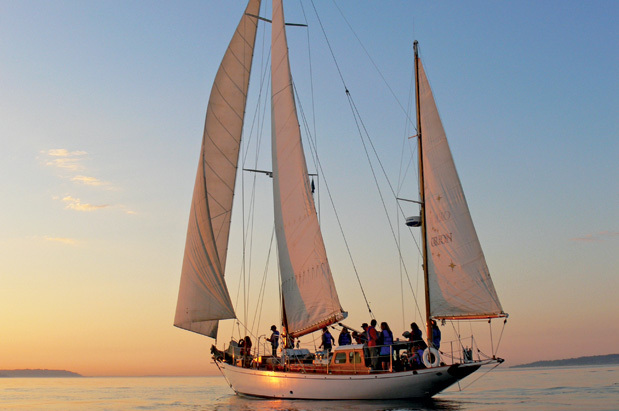 Wooden boat aficionados might prefer to charter a sail on Shilshole-based Orion, a 64-foot yawl (two-masted yacht) built in 1934 and lovingly restored in 2010 by captain Kevin Campion. The Orion is available for skippered charters through Deep Green Wilderness (deepgreenwilderness.com). With so many options for wannabe sailors, all it takes to get your sea legs is a modest investment, a little effort and a strong breeze.